As promised yesterday, I am here today with the comparisons I did for the colors in this year's Essie bridal collection. 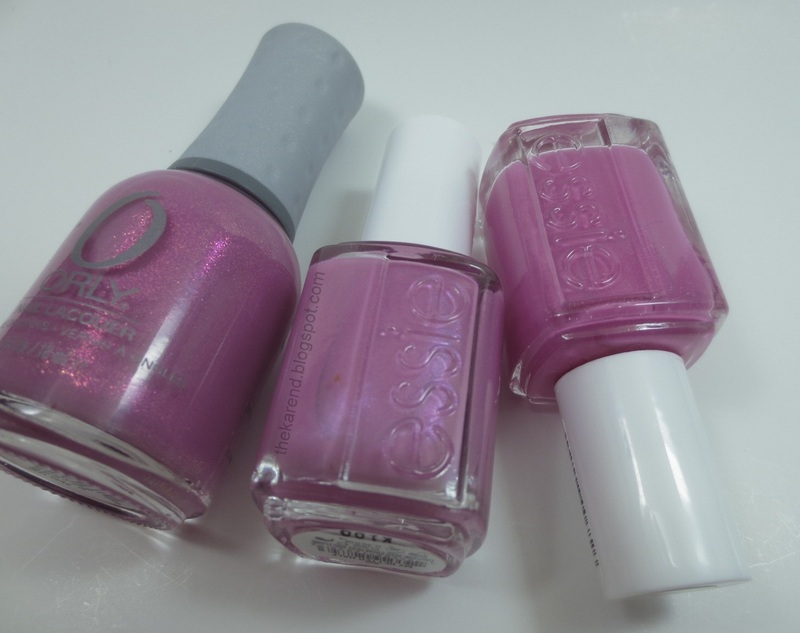 I wasn't necessarily on a dupe hunt with these, just looking to see how they matched up with similar shades, either ones out now from other brands or ones Essie released in previous collections or in one case a favorite from my Top 20 list for last year. First up, I have No Baggage Please with two other recently released pinks, Nicole by OPI How Fairy Nice of You from the Tinkerbell collection and Sally Hansen Xtreme Wear Berry Juicy from the latest display out for that line. Now, I do realize that the Essie here is a shimmer and the other two are cremes, but the shimmer in No Baggage Please is on the subtle side and the two creme pinks were the closest hues I had in my swatching box so I went ahead. 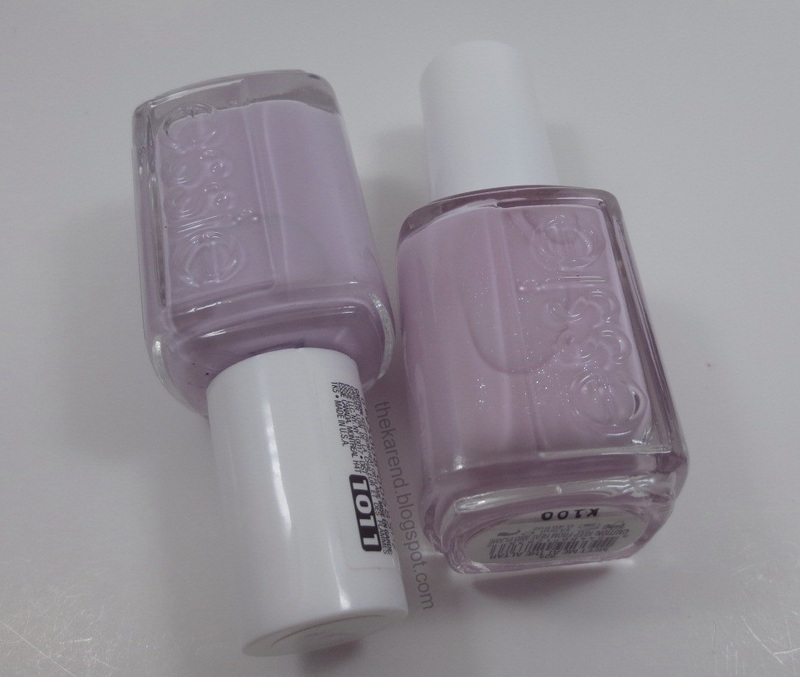 There's no shortage of pale warm purples from Essie; I only had to go back to Spring 2013 to find Go Ginza to compare with Meet Me at the Altar. Again, it's a subtle shimmer versus creme situation. Meet Me at the Altar is a bit warmer toned than Go Ginza. Left to right below: Meet Me, Ginza, Meet Me, Ginza. I used three coats of Meet Me and two of Go Ginza. 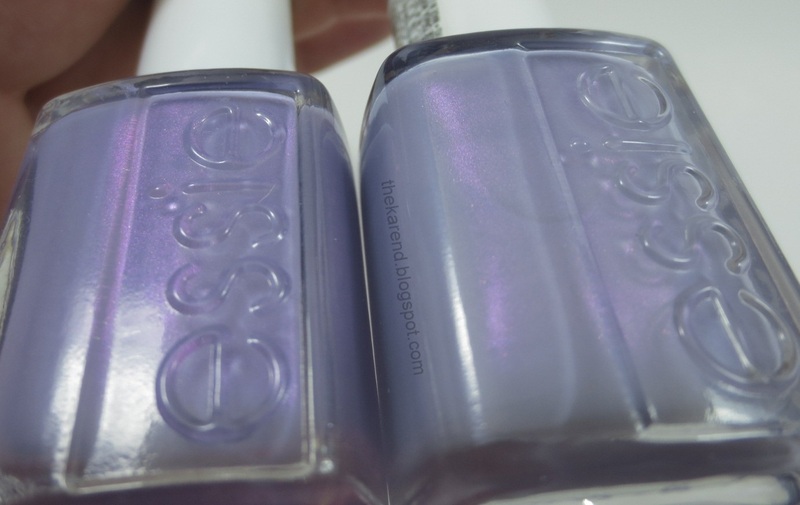 I knew right away which polish I wanted to pull to compare to Using My Maiden Name—She's Picture Perfect from the Essie 2012 Resort collection was also a blue violet with subtle pink shimmer. Using My Maiden Name is closer to the purple and vibrant side of perwinkle than She's Picture Perfect, which is more blue and even a touch dusty in hue. Left to right below: Maiden Name, Picture Perfect, Maiden Name, Picture Perfect. Both were three coats. For My Better Half, I grabbed Orly Preamp from their fall 2012 Electronica collection (and my 2012 Top 20) and Essie Madison Ave-Hue from Spring 2013. These are all shimmers but range from very subtle to more flashy. The Orly has an orange-y pink microflakie shimmer that pops against the purpley pink base color. My Better Half has a very low key pearlescent shimmer. Madison Ave-Hue has scattered white/silver flecks, similar to No Baggage Please and Meet Me at the Altar but a bit more visible due to the darker base color. Left to right below: Preamp, My Better Half, Madison Ave-Hue. If I'd looked harder, maybe I could have found some dupes for these Wedding collection colors in the depths of my stash, but I'm coming around to the mindset that it's more useful to see how current polishes compare to fairly recent colors than discovering that a polish out now is an exact match for some Maybelline color from the 80s. Maybe this is the first step to me letting go of some of those older polishes. I've got to start letting go of something, that's for sure, given that my Helmers are overflowing. You can use the comments section to let me know what you find helpful in comparisons. Wonderful comparisons!! :D Oh, I will always love Preamp!! Wow Using my Maiden Name and She's Picture Perfect are close enough that I don't have to have both of them which is nice. I don't know which one I like better though lol I too need to destash a bit because I am overflowing my helmers and I don't have room for more. I can't seem to let go though. You will have to keep us posted on how your destashing goes and how you decided to pick which ones from your collex (ie older polishes, dupes, not your favourite brush, bottle shape, etc etc). I've thought about doing this for some time now, but I'm afraid I'll have polish regret. I have a few set aside for an eventual destash (mainly backups) but just can't seem to do it! I think it's INTERESTING to know that something's a dupe from some long-ago Maybelline or Revlon or whatever, but more useful to know about stuff from the last year or two. My old Maybelline and Revlons are mostly all gone - you must have been more vigilant about keeping yours tightly capped or something, because mine all tended to get gooey and I eventually threw them out. Something like the texture comparisons that you and several other people have done lately is really useful, though - knowing that Julie G Sugar Rush and OPI Jinx (if I'm remembering correctly) are virtual dupes keeps me from coveting Jinx, for example, since I already have Sugar Rush. I completely agree with one of the posters comment above. Its nice to see dupes for long discontiued items, but its very handy and informative when recent collections are compared as well. It helps save money too (and possibly a bottle of polish for another np-lovin-gal on the hunt for *sometimes* hard to spot collections)Thanks for all your hard work Karen! Aw, please don't let go of your 80s polishes! They don't sell time machines at Ikea! I love comparisons posts of all kinds and your swatch wheels are my favorite thing in the world! Comparing recent or popular shades is useful even if they aren't actually dupes, because it helps me determine where a color lies on the warm/cool scale. etc. Either it helps me figure out which one I'm going to get, or if I may actually "need" all of them, lol. I like older shade comparisons too, but especially when it's a color that is hard to find, highly sought after, and/or more expensive.